This is a photo of founding member and Brooklyn SCORE chairman Eleanor Stein. In the photo, she is a law student at Columbia University in the late 1960's. An Erasmus High School student when he helped found the student chapter of Brooklyn CORE, she was involved with Brooklyn CORE’s campaign against Ebinger’s Bakery and attended the March on Washington. 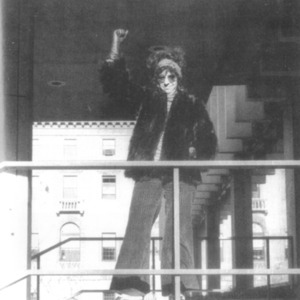 As a student at Columbia University’s Law School, she was a spokesman for the SDS group during the student rebellion at Columbia University in 1968. She was among the SDS members that broke away to form the Weathermen which became the Weather Underground. She married twice and changed her name to Eleanor Raskin and Eleanor Jones. She changed her name several other times when she lived in the run under assumed aliases to avoid arrest for her membership in the Weatherman. She eventually went back to school got her law degree and has been working as a judge in upstate New York. “photo of Brooklyn SCORE chairman Eleanor Stein,” corenyc.org, accessed April 22, 2019, http://corenyc.org/omeka/items/show/306.